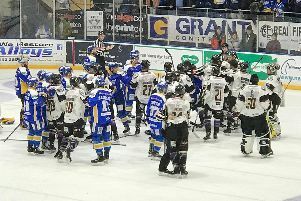 The captain of Manchester Storm has denied intentionally starting the altercation that led to a post-match punch-up at Fife Flyers last night. 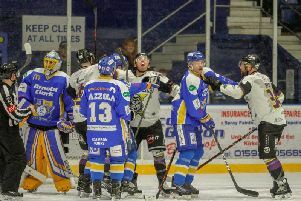 Dane Byers was seen confronting Fife players after the handshakes, on the opposite side of the rink from the rest of his team mates, following his side's 2-1 defeat. However, the former NHLer insists he was not intent on causing trouble, rather he was confused by the custom at Fife Ice Arena, which sees teams swaps ends after full-time, this despite Byers having played in Kirkcaldy on numerous occasions in his season and a half in the Elite League. The 32-year-old Canadian even went as far as accusing the home players of starting the verbal altercation which led to the fighting that took place, and resulted in Fife defenceman Evan Stoflet suffering a concussion. Byers said: "After the game in Fife and after shaking hands with their players and coaches I returned back to our end of the ice before the man of the match is announced. "To my knowledge every team in the league returns to their own end for this. "I, unknowingly, didn’t realise that Fife do it differently to every other team in the league. "Once I realised I was alone with all of the Fife players I began to get verbally attacked from many of them. "As a hockey player I stood my ground but not going any further than a few words back. "This is what started a regrettable altercation that I had no intention of starting, which I believe the video shows."